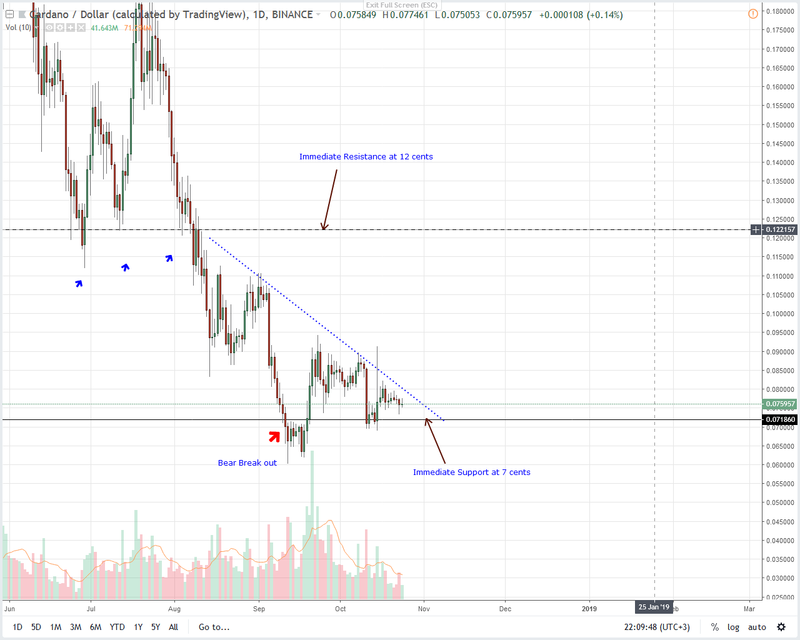 Overly, traders are optimistic expecting prices to rally past key resistance trend line as ADA/USD, LTC/USD and EOS/USD gain momentum and bottom out from important support levels. This stand is valid more so when we factor in fundamental like the probable launch of Bitcoin ETF which could lift BTC and altcoins with it. That’s aside from coin specific news that plays a huge role as price determiners. No doubt, EOS is ranging and we can see that from the way prices are moving. In fact, prices are trading within tight trade ranges in the weekly and daily time frames. Though the inactivity can be spur loss making, savvy traders should see this as an opportunity to buy on dips in lower time frames now that prices are still stuck inside Oct 15 high low. 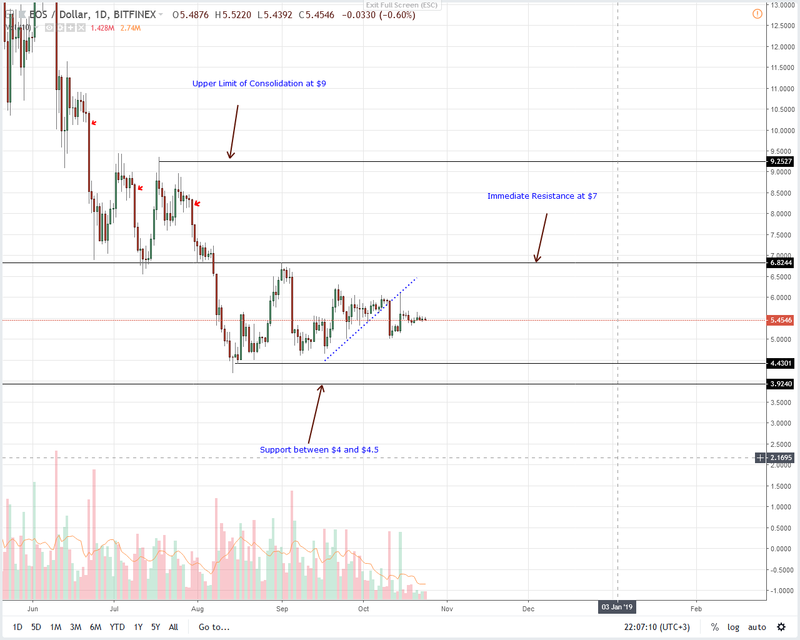 That strong bullish bar is the highlight of our analysis and unless otherwise there are losses below $4.5 or $4, we retain our upbeat outlook expecting EOS prices to race above $7 triggering bulls in sync with our previous EOS trade plan. On a weekly basis, Litecoin is down roughly four percent but pretty stable in the daily time frame. Because of the last two bull bars, the strength of $50 as a reliable support line is clear and as per our iterations, we expect LTC to muster enough momentum and reverse this year’s losses. Remember, despite the inactivity and positive forecast, Litecoin is down 70+ percent from 2017 highs. When we apply Fibonacci retracement rules to judge possible reaction points then odds are LTC is likely bottoming up. As such, we recommend aggressive traders to load up at spot prices with first targets at $70 and stops just below Oct 14 lows at $50. 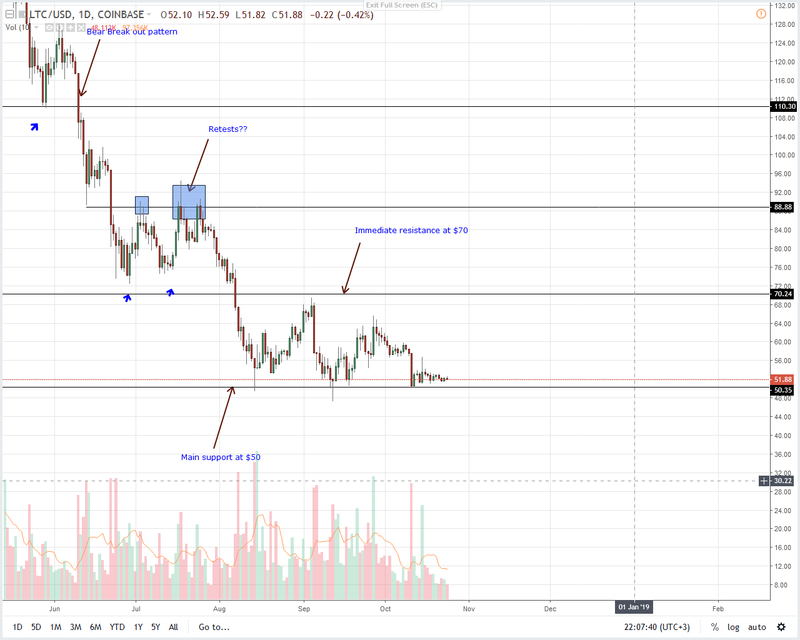 Like before, losses below $50 could be deflating for buyers who are optimistic for a possible rally towards $110 now that Litecoin core implementation will see transaction fees drop by a factor of $10 spurring mass adoption. News is a new stable coin, Novatti AUD, pegged to the Australian Dollar and leveraging on the Stellar protocol will hit the market by Nov 19 Novatti Group has announced. Novatti Group is an online payment processor operating from Australia but processes payments for clients all over the globe including MoniSend of South Africa and Vox Telecom.However, the new stable coin is specifically designed for businesses and ordinary crypto users who want to make purchases or send funds over the Stellar blockchain. XLM is up four percent in the last week and stable in the last day. Despite our optimism, the lack of movements in lower time frames that is made worse by a ranging market means our last Stellar Lumens trade plan is valid. When we zoom out the XLM/USD chart, we easily note that prices are in range mode with clear resistance at 30 cents and support at around 15 cents-20 cent zone. Unless otherwise, we recommend neutral until after we see prices close above 25 cents as bulls get in and align with the general trend set by Oct 15 bulls. Technically, risk-averse traders should stay on the sidelines until after there are gains above 30 cents. Thereafter, conservative traders should buy on dips with targets at 50 cents in a bull break out trade. Conversely, losses below 15 cents and XLM might end up dropping towards 8 cents or lower. Trezor, a hardware wallet, will support ADA according to the recent announcement by Charles Hoskinson, the founder of Cardano smart contracting platform. The wallet will officially support ADA from late October and is a timely move coming at a time when Cardano is accelerating their development as they ready for Project Shelly whose main theme is decentralization. 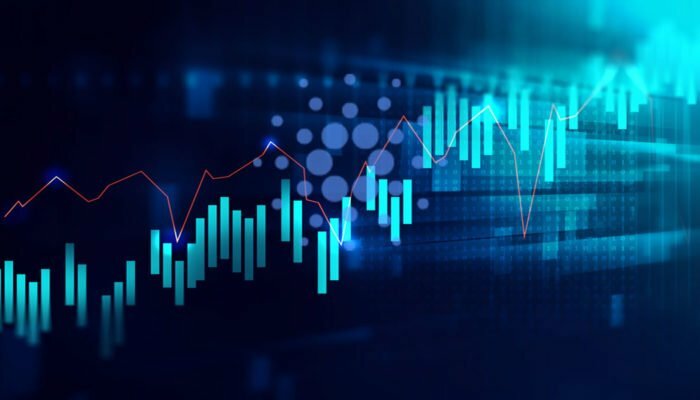 Thing is, Cardano (ADA) is technically bullish and it is not hard to see why. Well, aside from the CoinBase effect, candlestick and technical arrangement point to bulls following the more than 95 percent decline from 2018 highs. Aside the deep correction that is more often than not accompanied by price expansion, events of Oct 15 is feeding bull momentum. Confirming this is the rejection of lower lows as ADA prices consolidate horizontally within a tight 1 cent range. Because of this, our last Cardano trade plan is valid and we shall retain a neutral stand until when we see rallies above the minor resistance trend line and 9.5 cents on the upside. 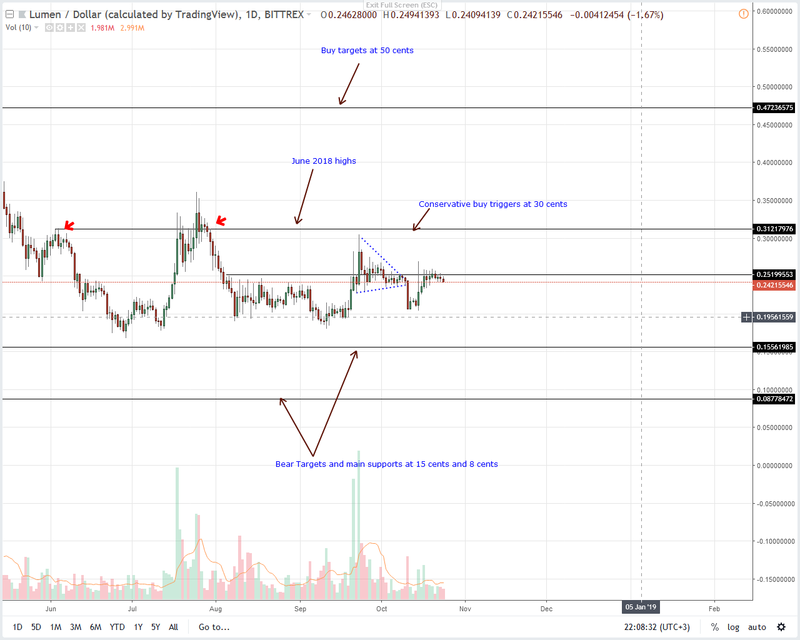 If ADA rally past 12 cents-main resistance and buy trigger line, then conservative traders can as well buy on dips with first targets at 20 cents as laid out before. On a three or four-day time frame, XMR prices should print a doji reflecting the general indecision following Oct 11 complementing our previous Monero bear projection and Oct 15 surges where our stops were hit. 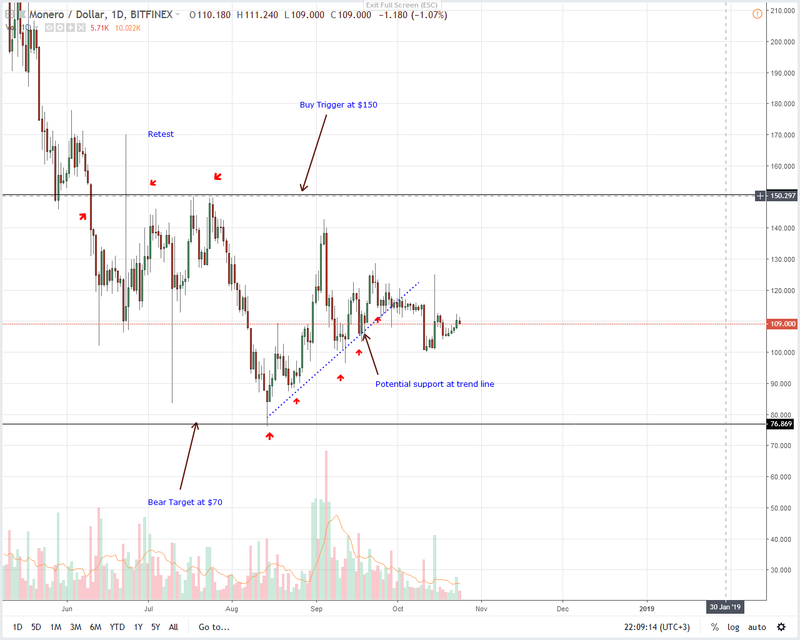 Therefore, though Monero is edging higher, we shall prefer taking a neutral stand until XMR bulls’ edge past the minor resistance at $120 beckoning short term, aggressive bulls aiming at $150—another important buy trigger line. However, any price collapse leading to losses below $100 shall trigger the first wave of sell pressure with modest targets at $70 and later $30 if the shift in momentum is strong enough.